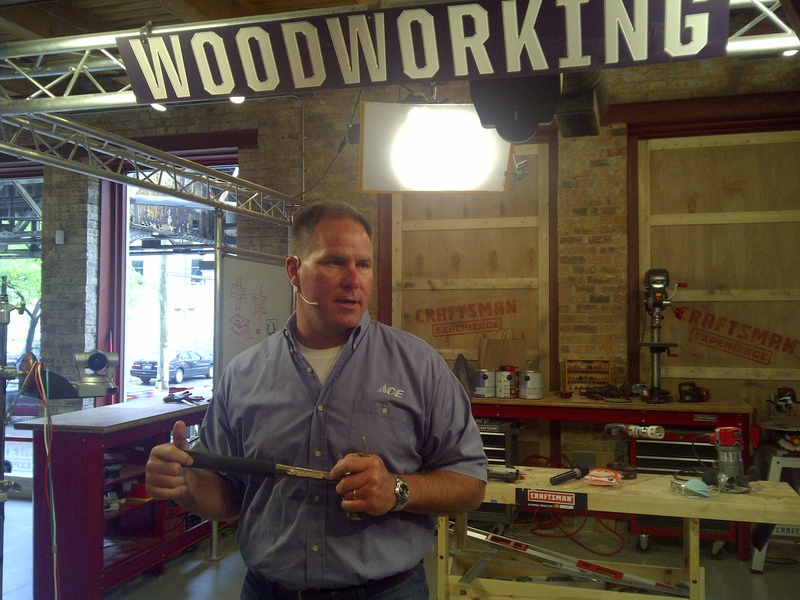 At the Craftsman Blogger Summit in June, before we were allowed to use any of the tools at the Craftsman Experience, we were introduced to Lou Manfredini. Lou works for Ace Hardware as their Home Expert. At the Summit, he was the one in charge of making sure we knew how to use the equipment safely. After I returned from Chicago, I was contacted on Lou’s behalf: Would I like a home improvement themed guest post? It was bound to lean a little heavily on the “Go to Ace Hardware for your needs…” stuff, but since I actually do shop at Ace Hardware I don’t really have any antipathy for it. So, here is a home improvement themed guest post, by Ace Hardware Home Expert, Lou Manfredini. If you’re looking to make a few updates around your home this summer without breaking the bank, look no further. With a very small investment and a little effort, any homeowner can tackle these tasks and reap the benefits. Here are three easy home maintenance projects that you can get done in just one weekend – or less! Maintain your outdoor spaces. Any homeowner that has a deck or outdoor wooden patio knows how quickly the sun or moisture from rain can ruin the natural beauty of the wood. There is an amazing clear, wood stain called Flood Clear Wood Finish with UV Protection, which is available at Ace Hardware, that not only seals the wood and protects it from moisture; it also offers UV protection from the sun. The stain can even bring life back to weathered wood and depending on the size of your deck or patio you can make your space beautiful again for as little as $20. Change front door light fixtures. By changing your light fixtures you instantly transform the main entrance to your home, adding ambiance and curb appeal. With so many options available, it’s important to take the size of your door and entrance into account when you make your selection. If you have a small entryway, I recommend a chain hung lantern mounted over the front door. This will maximize the light without over shadowing the beauty of the door. For homeowners with a large front entryway, I recommend adding wall lanterns on each side of the front door, slightly above eye level. When installing, make sure the breaker is off and follow the installation instructions that come with your new fixtures. Refresh your hardwood floors. New floors are expensive, but most hardwoods can be freshened up inexpensively with a coat of waterborne urethane like Ace Great Finishes® Water-Based Poly Finish. Before you begin, make sure to clean the floor thoroughly. Then, apply the finish with a synthetic sheepskin pad and let cure for a couple of hours. The urethane will remove many of the scratches and add a new shine so your floors look like new. For more product tips and advice to help you turn your home maintenance to-do list into a to-done list, head to your local Ace Hardware store or visit www.acehardware.com. Previous Previous post: The Craftsman Blogger Summit: Wow, that was like, two months ago.